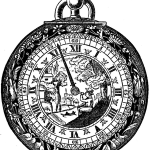 A collection of public domain clock images. 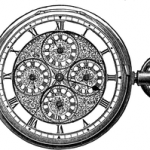 They range from drawings of grandfather clocks to drawings of pocket watches. All of the timepieces pictured in this group are public domain images that can be freely used in your next scrapbook page, mixed media artwork, collage or other artistic creation. Vintage black and white carriage drawing from a wonderful book all about time and timepieces. 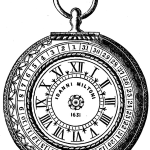 Meridian watch drawing from an 1875 book on time and the wonderful timepieces we use to measure time. 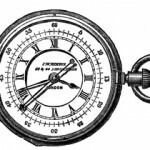 Vintage chronograph drawing from an 1875 book about time and timepieces. Vintage timepiece from 1631 with an interesting past. A great pocket watch drawing. Vintage ornamental watch drawing from a 1875 book dedicated to historical timepieces. Great Reusable Art piece with lots of options for its use. 1878 era pocket watch advertising image. 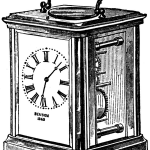 Vintage drawing of a brass clock. Vintage drawing of a wall clock. 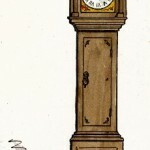 Public domain drawing of a grandfather clock. Wonderfully vintage time flies metaphor image from the 1800s. Wings and an hourglass in black and white – a great drawing for those layered art projects. 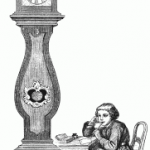 A vintage magazine image of a tall-case grandfather clock. A tall grandfather clock strikes the hour and the cuckoo appears.